The earliest form of dip pens for which we have a description was the barrel pen. By the 1830’s this form had dropped out of favor for what we know today, which was originally called the slip pen. In my latest post, I take a quick look at these two forms. We get a glimpse of possible beginnings of the slip pen and we range widely over early steel pens, the last gasp of quill pens as they react to these new metallic substitutes, and how gold pens learned a thing or two from the older barrel pens. What’s new: More history – Washington Medallion, and stub pens. I’ve just posted the most recent chapter in the history of the steel pen. 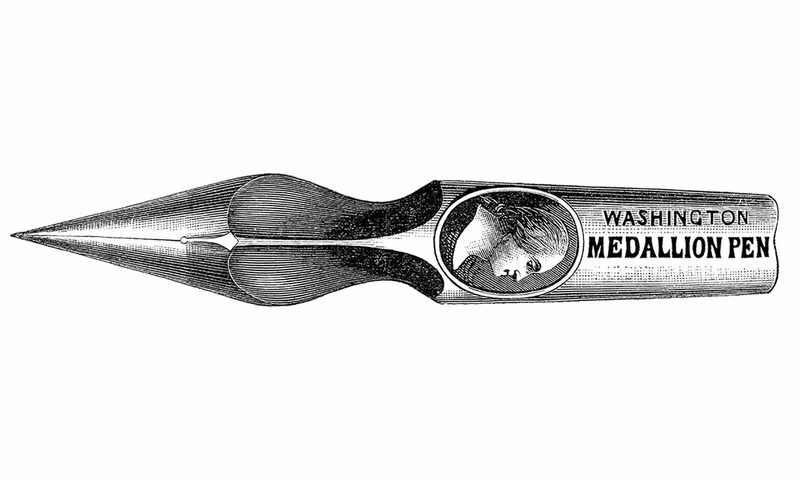 This is the first installment of the story of the Washington Medallion Pen Company. This promises to be a rather more involved and detailed look at the most important of the 1850’s pen companies. Washington Medallion is also very different from other pen companies in the US or anywhere in that they only produced one style of pen, instead of the hundreds of styles some companies, like Esterbrook, once produced. This first installment gives a brief summary of the company. It will be followed by further chapters covering the major eras of the company, including the legal battles, the people involved, some of whom go on to found other, more famous pen companies, and the role Washington Medallion had in the beginnings of the Golden Age of steel pens in the US. Also, in case you missed it, I recently added another post on a common style of steel pen, the stub. Many folks interested in fountain pens are familiar with stub nibs, but their predecessor is the stub dip nib. These came in many sizes and styles for various uses, but their common ancestor was most definitely the quill pen.